The Paris Agreement: The End of Fossil Fuels Is Near. But Where Is Justice? We at Greenpeace had three key expectations for the Paris Agreement. 3. global solidarity, including a way to make polluters pay for the damage they cause. Today, we can say that we got one, achieved progress on two, and that governments mostly failed us on three. Justice and corporate accountability were the weakest points of the Paris deal. After Paris, there can be no doubt that the time is up for fossil fuels. Even The Economist concludes that after Paris "the idea of investing in a coal mine will seem more risky." Governments chose convoluted language, but the only realistic way to achieve the new "long term goal" they agreed to is to phase out fossil fuels by 2050. The deal leaves the door open for some bad things - such as plantations. We will be vigilant and ensure that the real solutions - like sustainable renewable energy and forest protection - are the winners, as governments implement the deal. Politically speaking, the language is surprisingly strong. The Paris Agreement goes further than the G7 summit commitment to "decarbonize" earlier this year. They have not yet committed to the just transition to a world run on 100% renewable energy for all that we seek. But the Paris deal will drive the energy revolution in the real world - it's already making shares in renewable companies go up. We already know that the pledges governments made to Paris are not good enough and will still lead to a very dangerous and destructive world (between 2.7 and 3.7 degrees Celsius warmer than in preindustrial times - the estimates vary). The Paris agreement does not force governments to change and change fast. That is in blatant contradiction with the new 1.5 degree goal, which can only be achieved if we make drastic emission cuts in the next 10 to 15 years. Indeed, we are on track to use enough carbon to exceed 1.5 degrees of warming before 2030 - that is, if governments don't ramp up their ambition. The agreement does help a bit by setting a review date of current commitments - 2018. It also makes it clear that there will be regular reviews of ambition every 5 years and that countries will always have to improve what they commit to. President Hollande in his final speech at the conference also promised more emission cuts and more financial support for developing countries before 2020. That's the dynamic we hope to see following Paris. Other leaders must follow. Because we have no time to waste. Overall the Paris Agreement fails the justice test. Fine words like "climate justice" and human rights are included only in the non-binding part of the text. Indigenous Peoples' rights (while also mentioned in the legal text) are not given the protection they deserve. Just as with emission cuts, we know that the current money available to help the impacted adapt to climate change is not enough. The Paris deal does too little to change that. "Loss and damage" - which refers to negative climate impacts that can't be adapted to - has however been included in the agreement. That is welcome (it was part of our test). But the Paris Agreement fails to support the idea that major carbon polluters should be made accountable for the damage they have caused. We will have to pursue such justice elsewhere. For us, one of the best moments of the last two weeks therefore did not happen in Paris but in Manila. The Philippines Human Rights Commission launched a probe into 50 major polluters for potential human rights violations on December 10th. That's a major step - as inaction on climate change does indeed violate human rights. All in all, governments took us a step forward in Paris, especially on making it clear that fossil fuels will be history soon. But even if the Paris Agreement had met all our criteria, it would have only been one stop on the long road to climate justice. The key issue is not what is in this deal but what will happen next. And that is why I am optimistic. 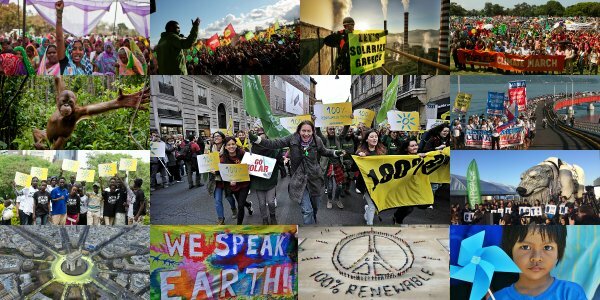 The climate movement has shown its strength in Paris. Out there in the real world, coal demand is in terminal decline and after a dramatic change of energy policy in China we may have reached the global peak of emissions already. People power has also brought real trouble for the oil polluters: Shell had to retreat from the Alaskan Arctic, for example, and President Obama rejected the Keystone XL pipeline. In 2016 we - the entire climate movement - will escalate the opposition to fossil fuels all over the world. I leave Paris encouraged. People power will drive the change and solutions we need.